Astrophysicists from the CHIME (Canadian Hydrogen Intensity Mapping Experiment) Collaboration spotted 13 new fast radio bursts (FRB) — powerful radio flashes arriving from far outside the Milky Way. They arrive with mysterious origins that continue to be a matter of debate. One of the newly-detected events is the second known example of a repeating FRB. Fast radio bursts are mysterious and rarely detected bursts of energy from space. FRBs have durations of milliseconds and exhibit the characteristic dispersion sweep of radio pulsars. These events emit as much energy in one millisecond as the Sun emits in 10,000 years, but the physical phenomenon that causes them is unknown. The first FRB was discovered in 2007, although it was actually observed some six years earlier, in archival data from a pulsar survey of the Magellanic Clouds. “And with more repeaters and more sources available for study, we may be able to understand these cosmic puzzles — where they’re from and what causes them.” The repeating event — designated FRB 180814 — was one of a total of 13 bursts detected over a period of just three weeks during the summer of 2018, while CHIME was in its pre-commissioning phase. 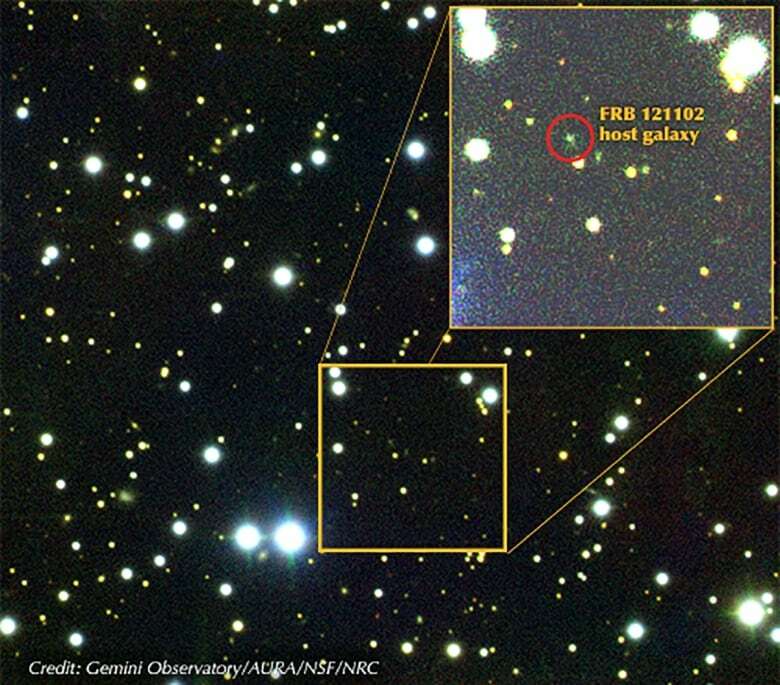 The revolutionary radio telescope observed at least six flashes from FRB 180814. Before CHIME began to gather data, some scientists wondered if the range of radio frequencies the telescope had been designed to detect would be too low to pick up fast radio bursts. Most of the FRBs previously detected had been found at frequencies near 1,400 MHz, well above the CHIME’s range of 400 MHz to 800 MHz. The latest results settled these doubts, with the majority of the 13 bursts being recorded well down to the lowest frequencies in the radio telescope’s range. In some of the 13 cases, the signal at the lower end of the band was so bright that it seems likely other FRBs will be detected at frequencies even lower than CHIME’s minimum of 400 MHz. “Whatever the source of these radio waves is, it’s interesting to see how wide a range of frequencies it can produce,” said CHIME team member Dr. Arun Naidu, a researcher at McGill University. “There are some models where intrinsically the source can’t produce anything below a certain frequency.” The majority of the 13 FRBs detected showed signs of ‘scattering,’ a phenomenon that reveals information about the environment surrounding a source of radio waves. The amount of scattering observed by the team led them to conclude that the sources of FRBs are powerful astrophysical objects more likely to be in locations with special characteristics.